Greg Loftus holding a pickled test panel in place. In addition to being a consummate carpenter, Greg also the front man for the Austin-based band Carpetbagger. Part of the design process that we really enjoy is transforming commonplace materials into something special. At the Hartstein Ramshaw house, we've been experimenting with structural elements and materials that would typically be covered over. In addition to the wall studs in the clerestory windows, we're also exposing the B-C grade plywood of the living room ceiling. This construction grade utility plywood has two types of faces; the B-side is an appearance grade face suitable for high-quality staining and paint finishing, and the C-side is the rough non-appearance side with visible knots and defects. We've been working with the contractor, Gray Renovation, to explore different options to give the exposed B-side a bit more of a refined finish while still preserving the natural grain of the wood. 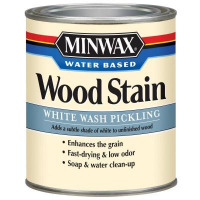 After testing a variety of finishes and stains, we've chosen a combination of Minwax Pickling Stain with a clear polyurethane finish. The pickling stain evens out the grain of the B-side with a subtle, nautical whitewash, while the clear polyurethane finish gives it a pearly luster. These test samples show the difference between a clear-coat of polyurethane and the pickling stain/polyurethane combination. More photos to come as the ceiling receives this treatment.